In this chapter we’ll explore what work we do that’s useful and what work we do that isn’t useful. There is a fair amount of misunderstanding about what is waste because many people take the Lean concept of waste from the manufacturing world. In knowledge work things such as planning and estimation should not be considered waste since they help shorten the cycle time of the work being done. Of course, it is possible to over plan or take too much time to estimate. We’ll start with an exercise to get you thinking. Take out two sheets of paper. 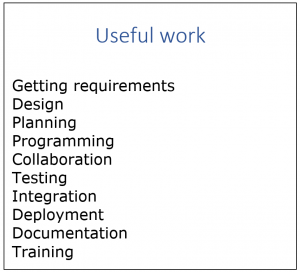 On one of them put the title “Useful work” and on the other put “Wasted work.” Consider the work you do that adds value, such as getting requirements, and write them on the “Useful work” page. 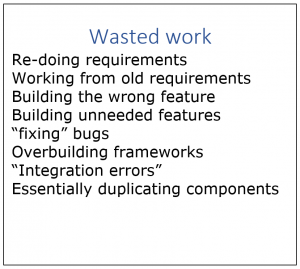 Then consider the work you do that is really wasted, such as fixing bugs. Take 10 minutes and think of as many of these as you can for each page. Scroll down after completing the exercise. Here are two lists of useful and wasted work that I’ve come up with. Of course, neither are complete but both give an idea of what’s involved. Let’s go through these and see if we can learn something. If you have items on your wasted work page not listed below, do your best to analyze it in the way I’ll be analyzing my list. There is a pattern to wasted work that is worth understanding. Let’s go through each of the items listed there and see what we can learn. Our useful work makes progress on the mission of your organization. Induced work is work was created by making a mistake or having a misunderstanding. I’m not suggesting mistakes and misunderstandings can be avoided. However, the amount of the induced work greatly increases the longer the time from the error until it is detected. I suggest we can usually vastly reduce the cost of the mistakes even when we can’t avoid making them. The common theme in doing this will be to minimize the time from making the mistake until detecting it. The notion that delays increase our waste can also be applied to most of the other items on the right. Let’s see. If we focus on building the most important features in small batches we can use what we learned to see if we actually need the pieces we deferred. This is another tenet of Lean – work on small batches. This accelerates value delivery while shortening delays to feedback. All of this contributes to reducing induced work. Let’s look at the other items on the list of induced work. You may have noticed that the fixing, in fixing bugs, is in quotes. The reason is that developers don’t actually spend a lot of time on fixing bugs even though they have the experience that they do. Let me explain. Some people protest that this is just semantics. I disagree, but even if true it’d be important. There are two activities taking place here. The first is a discovery of what we have to do (finding) and the second is doing it (fixing). Let’s take a look at this another way. Imagine a developer writes a bug. As a small aside I’ve noticed that developers talk about bugs as if they don’t write bugs but rather that they either show up or testers put them in. Notice how they often say “I found a bug!” or “testing found a bug!” as if they had nothing to do with it. BTW: I noticed this by observing myself, so I’m not deriding anyone. Anyway, now imagine that he/she is told about it immediately. How long does it take to fix? Let’s say an hour. Now, imagine that they aren’t told about this for a couple of weeks and further imagine that nothing else has changed. How long does fixing take now? Lot’s longer, maybe days longer. And it gets even worse if you have other work going on where the code has been changed by others or is using code modified by others since the original code was written.